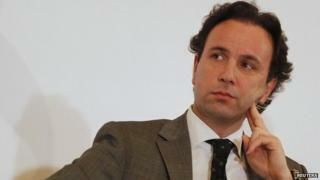 The newly-elected head of the main Western-backed Syrian opposition alliance, Khaled Khoja, takes his post at a time when Islamic State militants control large areas in Syria, despite international efforts to stem the group's rise. Crucially, Mr Khoja replaces Hadi al-Bahra as head of the National Coalition for Syrian Revolutionary and Opposition Forces at a time when Moscow has launched a bid for fresh dialogue between Bashar al-Assad's government and the opposition. He is the first member from Syria's ethnic Turkmen minority to lead the body. In his first speech since being elected, Mr Khoja ruled out negotiations with "the Assad regime" unless "they bring about real and complete political transition". "Outside of this framework, we cannot sit down with them for talks," he said. Mr Khoja denied the presence of any Russian or Egyptian initiatives for negotiations, saying that the coalition was only "holding discussions with all Syrian opposition factions". He outlined his priority as "ending the suffering of the Syrian people", emphasising the coalition's "duty" towards them. With the Turkey-based National Coalition sometimes seen as being out of touch with Syrians, he stressed that it would "bring attention to inside Syria because that is where this revolution began". "They are the very people from whom we draw our legitimacy," Mr Khoja said. He has also pledged to "invigorate diplomatic moves with international parties" and seek further international support for the National Coalition and the "revolution". He is due to serve a one-year instead of a six-month term, after the National Coalition recently amended its rules. Image caption Mr Khoja says his priority is to "end the suffering of the Syrian people"
The 50-year-old leader has been involved in founding numerous opposition groups since the Syrian uprising began in 2011. He was a founding member of the Syrian National Council (SNC) in October 2011, the key opposition body before the current opposition coalition, which he helped to form in November 2012. Mr Khoja also established the Platform for Solidarity with the Syrian People with the start of the anti-Assad protests in March 2011. Until his election as president, he served as the National Coalition's representative in Turkey. In his youth, he was detained twice by the authorities of Mr Assad's father, the then President Hafez al-Assad. After being released from detention, he headed to Libya and then Turkey to complete his secondary and university education, graduating in Medicine from the University of Izmir. A member of the National Coalition's Turkmen bloc, he tweets on his account in Arabic, English and Turkish. He was born in Damascus in 1965 and is married with four children.